Last spring I wrote an article about Natal Classi, the brindle warmblood imported from Brazil several years ago. I had a few long and enjoyable conversations with Doni Biggs, his owner, hoping to write an article based on the interview. I never completed the article, but recently Natal is back in the news -- has has two foals on the ground! Here's a recent picture from Stoney Brooke farm where he is currently standing in Kentucky. You can read this post on COTH to get the latest buzz on Natal. 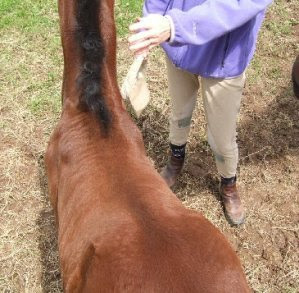 The Stoney Brooke Farm owner leads a discussion of Natal in this recent thread on groomingsupplies.com. The "buzz" is alternately fawning and skeptical. There's some conjecture about why Natal has not been campaigned, marketed, or bred extensively. From my talks with Doni, I think the answer is just that Doni is a pretty independent spirit, and after a lifetime in horse breeding she's not that interested in playing by the rules. Also she has some health concerns. But I admit I don't really know why we haven't seen more of Natal. Me, I'd be booking him on the Horse Expo circuits and giving the public a big treat! Apparently he's lost the patterning, but there is a chance it will return. At any rate, here is an inspection photo. Is he not lovely? He's pretty interesting in color that's for sure. I agree that you'd think they'd be doing more with him. I would like to see him moving. the cool thing is that they arent breeding just for color. there is obviously quality there as well. Amazing combination. I normally don't care about color (its like going to a car dealership and demanding a red car... not interested in the make or model) but darn that stallion makes me want a brindle horse! I just spent like two hours clicking around looking at brindle horses. What fun! I thought they were all chimeras; I didn't know there's an inheritable form of brindle. Pretty cool. I've never seen a brindle colored horse before! thanks! I was just going to say what LoveMyKarma did-- that the color is a nice addition to a really lovely animal, and that even if the foals don't wind up brindle, they are still really nice horses. All that being said, he's a treat to look at! Thanks for the lovely and absolutely "right on the mark" comments...especially from Ms. Stacy. Stac' I am in hospital for almost 2 weeks, today. Hopefully, out by Friday.....an FYI, my health HAS been a slippery slope but much work is improving it. One's health can be sooooo nagging...chronic dicomfort...and a pain in the old arse! I AM an independent sort, very A-Type & probaably ADHD! Well said...growing up in Germany & England thru-out the late 60's-early 80's...I had to be. Always the "American kid," guys...So I don't NEED to stand NATAL CLASI, anymore...simply ENJOYING him. Me & all my critters. Ohj, & Natal showed all over the East Coast. Did ya'll know that each of the "AA3" Shows Coast about $4-5K per week to do it right...Just to set the record straight, he showed 16 weeks in just one year. So he is VERY PROVEN! FEI jummper classes-(wins & places)and 2 $25,ooo CLASSIC WINS-(Huge! )-all with a youmg 154 y/o girl learning the ropes but most talented. He adored her. Very close bond for each. So cute. Well, I want you all to convince me to stand him! I have a super-duper farm ready to roll with him in 2009. They are very much reminiscent of my operation in the Gonzo I days. Nice, generous, professional folks. Wish to syndicate him. Reasonably. So everyone can try for a brindle at a reasonable cost. And be part of the party...maybe even history. There is a large offer on the table for him. Came out of the blue. But the syndication concept with an amazing yrly party for all shareholders, poss. a Breyer deal and a potential film...JUST TOO MUCH FUN! NATAL is about fun...he sure brings sighs and looks and smiles everywhere he goes. Exhibitions...sure, a possiblilty. Gals, he is my FRIEND. Mine...Not the public's...yet! But soon ...and you heard it here at Stacy's first! She is also a Natal fan as I have his pic next to me...the one by the lake I took 2 years ago...so soft, really like it. Love my stallions who did that...GONZO I, IRONMAN, SCHOENFELD "E" & RAINBOW did/do that. Top of the mark for a breeding sire. Hard to locate these type, as you can kiss a lot of frogs along the way. 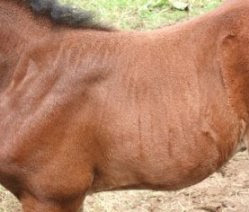 I know of a NATAL FILLY we ,might sell. Great hunter family. Half-brother currently cleaning up in the BABY GREENS. To the anonymous poster who commented on 3/12 -- I reject a few messages every year out of many, and yes, yours is on the cutting room floor. There are lots of places to go where you can spew invective, and it's esp. fun when it's ANONYMOUS and there are no repercussions. This blog is really about *horses. * It's not a forum about venting one's spleen or airing grievances. My email is out there if you want to use it. he's a pretty horse,he was create in my farm and i'm very happy to see him very well.i hope that he's making you very happy!!!! !